If you follow Florida Gulf Coast University athletics, you know the Eagles are winners. Consider that in 2016-17, FGCU captured its third consecutive Atlantic Sun Conference All-Sports Championship, and the swimming and diving team has won eight titles in nine years in the Coastal Collegiate Swimming Association. But beyond the courts, fields and pools, FGCU student-athletes also are winning at the “student” part of their game. With a 3.27 cumulative grade-point average this past spring, some 260 Eagle athletes in 15 intercollegiate sports topped the overall student average GPA (of 3.08) for the 16th consecutive semester. And with more than 7,000 collective volunteer hours performed by those student-athletes and the department’s staff in 2016-17, the regional impact of FGCU Athletics made the university one of three national finalists for the inaugural Community Service Award (with Maryland and East Carolina) presented by the National Association of Collegiate Directors of Athletics and the Fiesta Bowl. That’s taking FGCU’s formula for athletics success from the scoreboard and spreading it to the bigger game of a complete student life. Such accomplishments don’t happen by accident. While the FGCU coaches provide the most obvious guidance in building well-rounded citizens away from their respective sports, much of this non-competitive success can be credited to university “coaches” of a different sort put in place by Athletics Director Ken Kavanagh. Meet Kelly Jean Brock and Tom Roberts, who push the student-athletes academically; and Kathy Peterson, who coordinates the teams’ highly visible volunteer presence in the community. While the coaches and players go about their business on the competitive side of the equation, this trio behind the scenes makes sure the non-sporting side of running an NCAA athletics program gets the attention it needs. All three say the common denominators in achieving success in both academic achievement and community service are the same as those needed to build a winning sports team: effective time management and teamwork. Student-athletes touch the academic bases at the Hartley Academic Resource Center. Brock oversees two other full-time staff members, about 20 tutors and 15 student peer mentors who help athletes remain academically eligible and on track to graduate in four years. Athletes meet once or twice a week with the support staff to make sure they’re staying on course. 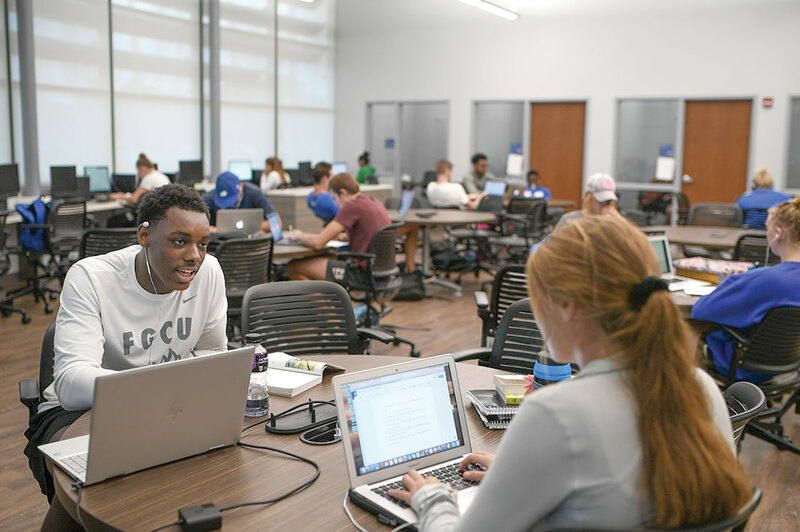 Besides the tutoring and coaching, FGCU Athletics works closely with Undergraduate Studies and takes full advantage of the Center for Academic Achievement and Writing Center. Team study halls are scheduled eight to 10 hours a week — with cellphones confiscated for maximum concentration. That’s where Roberts, an associate and graduate professor of Educational Leadership who serves as FGCU’s faculty athletics representative, comes in as liaison. At FGCU, another part of being a student-athlete is fulfilling the university’s requirement of performing at least 80 service-learning hours to graduate. Each of FGCU’s 15 teams completes at least one service project each academic year that engages at least 90 percent of the roster and doesn’t involve their sport. In other words, the baseball team can’t get off easy by staging a clinic for local Little Leaguers. The community visibility also helps attract FGCU’s neighbors to campus. “When people see our athletes and meet them, it makes them want to come and see them play,” Peterson said. This support system for success isn’t taken for granted by the Eagle athletes who benefit from it. Nick Rivera, a first baseman on the baseball team from Cape Coral who was the most accomplished power hitter in FGCU history with career team records of 46 homers, 63 doubles and 220 runs batted in, says he never would have earned his degree in criminal justice last spring if it weren’t for Brock, Roberts, Peterson and the rest of the team behind the teams.